Back at Palihouse last night after a two-week hiatus. What a welcome return: a full (or practically full) moon, a great, upbeat, eager crowd, my dear friend Jackson celebrating his birthday and a room full of friends to celebrate with! All in all a magical night. Daisy was out of town so Derek took over the controls and set them for the heart of the sun. A long winding set through Sixties pop and psych, power soul, disco, punk, funk, rap and California seventies classics, including a Neil Young shout out to the b-day boy. 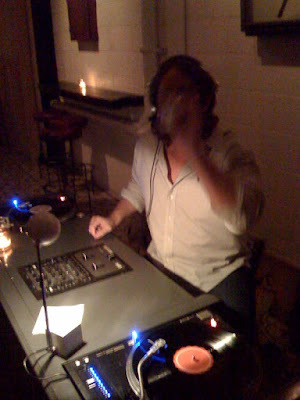 Special thanks to Gustavo, who took over late-nite and steered us admirably through the end of the (long) evening. And thanks to Jackson, Jasmine and all our friends who came out for the party, and to Palihouse managers Walter and Christian for showing everyone a good time. Good to be back! Fridays are stylin' and profilin' this Fall at Palihouse! See you all next time.